PNNL tools that track underground contaminants and speed carbon capture technology development are among R&D Magazine's 100 most innovative scientific breakthroughs of the year. PNNL's Real-time Four-Dimensional Subsurface Imaging Software, also known as E4D-RT, allows users to remotely differentiate contaminants from clean soils and determine what's causing the contaminates to migrate underground. 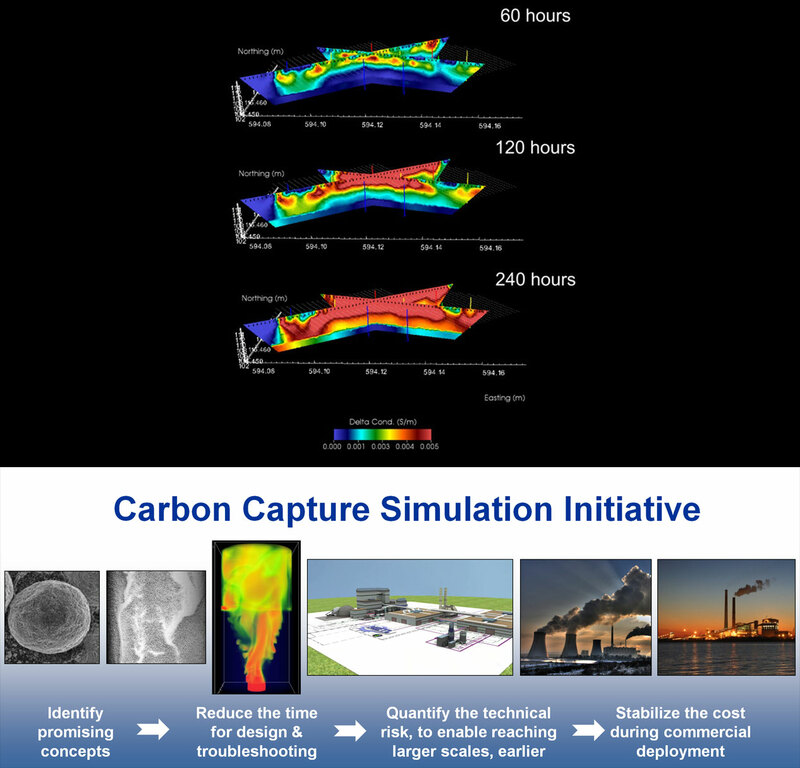 PNNL is among five national laboratories who co-developed the Carbon Capture Simulation Initiative, or CCSI, Toolset, along with industry and academic institutions. Shown here is the computational suite's capabilities, starting with identifying the best concepts and determining which experiments to conduct, followed by scaling up the technology to pilot and demonstration, and then full scale commercial deployment. RICHLAND, Wash. — Tools that track underground contaminants and speed carbon capture technology development are among the 100 most innovative scientific breakthroughs of the year, R&D Magazine has announced. Much like medical scans, a new technology allows users to remotely look into the Earth's subsurface in real time. Contaminants in soils often provide a high-contrast medium in comparison to clean soils. 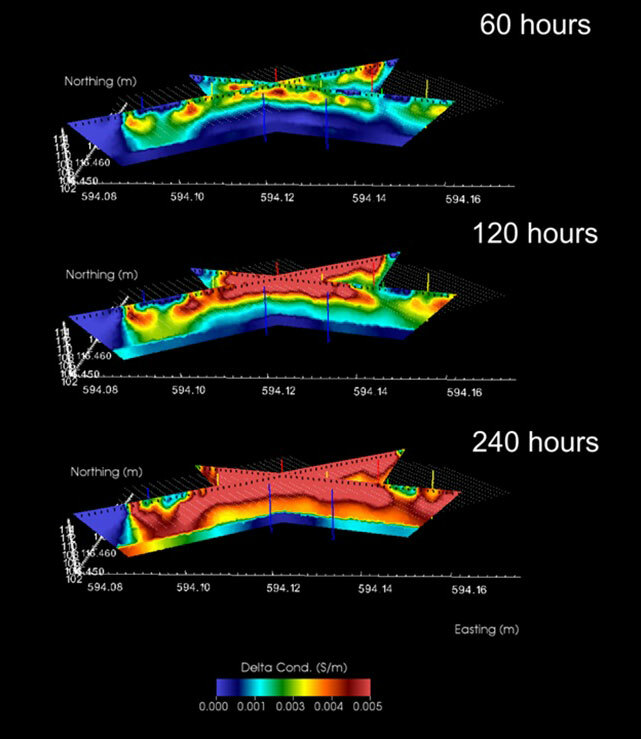 PNNL researchers developed and are applying Real-time Four-Dimensional Subsurface Imaging Software to determine the extent of contamination and what's driving its migration. No other commercial subsurface modeling software constructs 3D, time-lapse images of how the subsurface environment changes over time, in real time. "Snapshots" of subsurface conditions are collected by measurements made at the surface or by electrodes inserted in boreholes that pass an electrical current through the material being studied and record how difficult it is for that electrical current to move through the material. E4D-RT combines supercomputers to analyze large amounts of data with real-time imaging and the ability to model buried metallic infrastructure — like tanks and pipes. E4D-RT is a cost-saving open source solution for imaging in many kinds of subsurface studies — including fluid movement in geothermal systems and hydraulic fracturing operations and even understanding volcanic activity. E4D-RT was developed by PNNL's Tim Johnson. DOE's Office of Science and Office of Environmental Management supported the technology's development. The technology was developed through the Carbon Capture Simulation Initiative, which was sponsored by the DOE's Office of Fossil Energy and led by DOE's National Energy Technology Laboratory. PNNL is one of five national laboratories involved in the initiative, along with industry and academic institutions. PNNL's Xin Sun led a team for the initiative that co-developed the CCSI Toolset. Others involved in the tool's development are current PNNL staff members Zhijie Xu, Kevin Lai, Varun Gupta, Chao Wang, Greg Whyatt, Feng Zheng and Charlie Freeman, as well as former PNNL staff members Emily Ryan, Avik Sarkar, Wei Xu and Wenxiao Pan. More information about all of this year's R&D 100 Award-winning technologies can be found on R&D Magazine's website.